It's as if I'd never been away - back to Barnsley Archives this morning for our regular session transcribing and chatting. GB and I are still working on Cudworth Non-Conformist baptisms but as we progress towards understanding how the Archive's contents are catalogued we are beginning to find other treasures. My title for this blog post is a bit of a pun as the new name for Barnsley Archives is the Archives and Discovery Centre in Experience Barnsley in the Town Hall. The treasures at the Archives kept on coming today. I had taken in my July copy of the Family and Community Historical Research Society newsletter as they had printed an article I had written about Caroline Frudd, a Barnsley school mistress. The article was a re-written version of the blog post I did on this topic in February. Gill, another of the archive staff, took a copy of my article and then plonked two large blue volumes on the desk by my elbow. These were the transcriptions of the gravestones in St Mary's churchyard by Tasker, the same chap who wrote the original Barnsley Streets books, and also for the churchyard extension across the road. I had mentioned, towards the end of my article, that I didn't know of the existence of any transcriptions for this church, but I was very glad to be proved wrong! 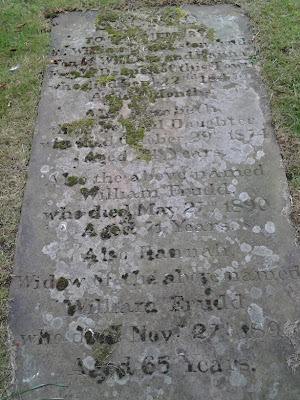 I was able to find the transcription for the Frudd gravestone fairly quickly, but aligning the map provided with the actual graveyard was a bit of a challenge. There didn't seem to be a key to which area was which, and my only clue was that the Frudd grave seemed to be in a corner of the churchyard. As we left the Archives GB and I walked around the University Campus Barnsley building and into St Mary's churchyard. 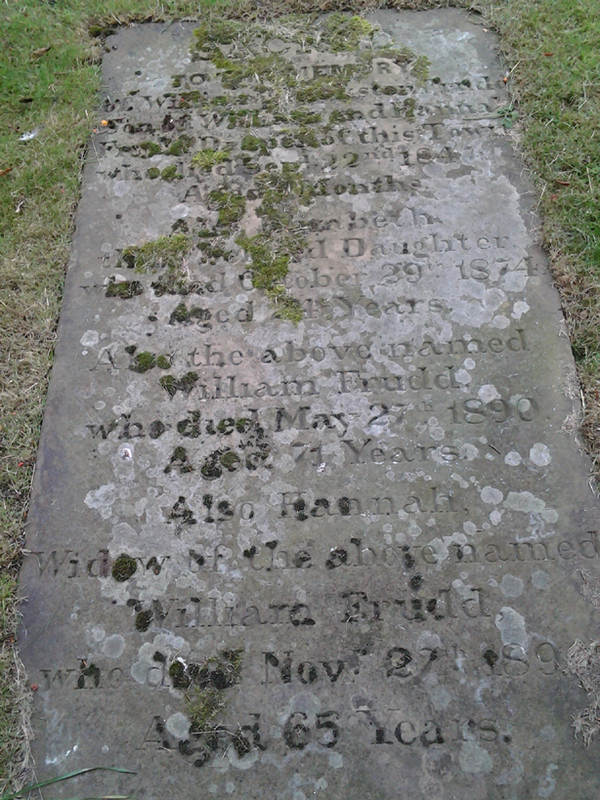 We only had to check two corners before I found the Frudd gravestone, a bit mossy but fairly readable - and anyway I had the transcription from the volume in the Archives so I didn't need to actually read all the words, just enough to confirm that they did indeed match what I had copied from the book. I hadn't known about the first child mentioned on the stone - little William Theakston Frudd. Living for only nine months in 1847, he hadn't featured on any census returns of course. It just goes to show that finding deaths and burials is useful to fill out family trees between the snapshots provided by the census. Interesting too that they gave him the middle name Theakston - that was Hannah, his mother's, maiden name; imagine the massive clue that would have been if this had been my own family I was researching and I hadn't been able to find the marriage yet! I look forward to next week's visit - finding out more about Worsborough Common with any luck and yet more delving into the treasures of the Archives.